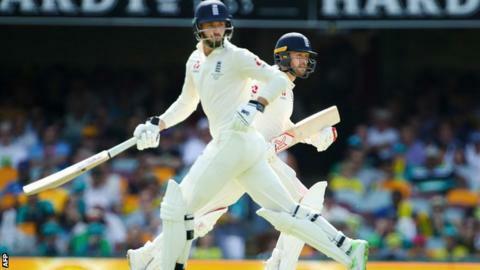 James Vince and Mark Stoneman have retained their places in England's Test squad for the tour of New Zealand, despite their struggles with the bat in the 4-0 Ashes defeat by Australia. Batsman Gary Ballance, bowler Jake Ball and all-rounder Tom Curran have been dropped for the two-Test tour in March. There is a first Test call-up for 24-year-old batsman Liam Livingstone, who will captain Lancashire this year. Bowler Mark Wood is also in the 16-man squad, alongside Ben Stokes. "With Tom and Jake being part of the Ashes squad and doing pretty well, I was surprised to get the call," Wood told BBC Sport. Is cricket the hardest sport to win away from home? All-rounder Stokes, 26, was arrested in September on suspicion of causing actual bodily harm following an incident in Bristol. The England and Wales Cricket Board have made him unavailable to play for England and will not review that stance until a decision has been made on whether to charge him. England face the Black Caps, who are one place ahead of them in the world rankings in fourth, in a day-night Test in Auckland from 22-26 March and then in Christchurch from 30 March-3 April. Ballance, 28, played in two of England's four tour games in Australia, scoring 51, one and 45 not out in three innings. He did not appear in Tests. Vince averaged 26.88 batting at number three in the Ashes and opener Stoneman averaged 25.77. "The way Stoneman and Vince played, they do deserve a bit more of a chance," England coach Trevor Bayliss told the BBC on Tuesday. "They were playing against one of the best attacks in the world in their home conditions and showed the potential they have. National selector James Whitaker said Livingstone, who averages 48.75 in first-class cricket, had been a "standout performer" in the recent Lions tour of Australia. "We are particularly impressed with the way he bats against spin and is equally adept against the seamers," said Whitaker. "He is a very talented and tough cricketer who has the ideal qualities and character to be successful in the Test arena." Test squad: Joe Root (Yorkshire), Moeen Ali (Worcestershire), James Anderson (Lancashire), Jonny Bairstow (Yorkshire), Stuart Broad (Nottinghamshire), Alastair Cook (Essex), Mason Crane (Hampshire), Ben Foakes (Surrey), Liam Livingstone (Lancashire), Dawid Malan (Middlesex), Craig Overton (Somerset), Ben Stokes (Durham), Mark Stoneman (Surrey), James Vince (Hampshire), Chris Woakes (Warwickshire), Mark Wood (Durham). It does seem remarkable that despite their repeated collective failure in the Ashes, England's top and middle order are set to remain unchanged for the series in New Zealand. Even Vince survives, having averaged 26 at the key position of number three and only 22 in 12 Tests overall. Indeed the only members of the Ashes squad to be dropped are Ball and Ballance, who played one Test between them, and replacement Curran. Stokes is included but his involvement remains subject to legal or disciplinary developments. If he is charged or faces no charges, the board will convene within 48 hours to make a decision on his availability. Wood finally returns after injury and the only new face is the hard-hitting but increasingly adaptable Livingstone, who enjoyed a successful tour of Australia with the Lions. Is cricket the hardest sport to win away in? Read more on Ashes: Is cricket the hardest sport to win away from home?